It’s been a while since we hosted a giveaway, and we thought now is a wonderful time to celebrate the new year and introduce you to a few of our favorite Melbourne based ethical, environmentally friendly, and natural brands at the same time! Organic, vegan baking mixes made from quality whole food ingredients and no nasties! 100% plant based and biodegradable. This spray is a powerful degreaser that tackles marks, food pathogens and bacteria, leaving kitchen surfaces so clean they squeak with approval. Also perfect to use on your yoga mat! Pity I am in the Netherlands, nice giveaway! Bake box, – all in one ! I would love to win because I would have a magnificent house to walk into and baked goods to serve. I am the smooth hostess. I’d love to win because I love trying new product. Often I do make great discoveries!! What a great way to promote a wonderful vegan lifestyle. I would absolutely adore this! Would love all of these but especially the bake box as I am over my normal sugar laden desserts and would love to try these. I would love to win this prize as I would use it to treat my mum who has cancer and she deserves a prize like this as she’s the best! This would be a wonderful birthday gift which is on the 26th February plus I had celebrated my 1st year of being Vegan in January! With vegan products = cruelty free. 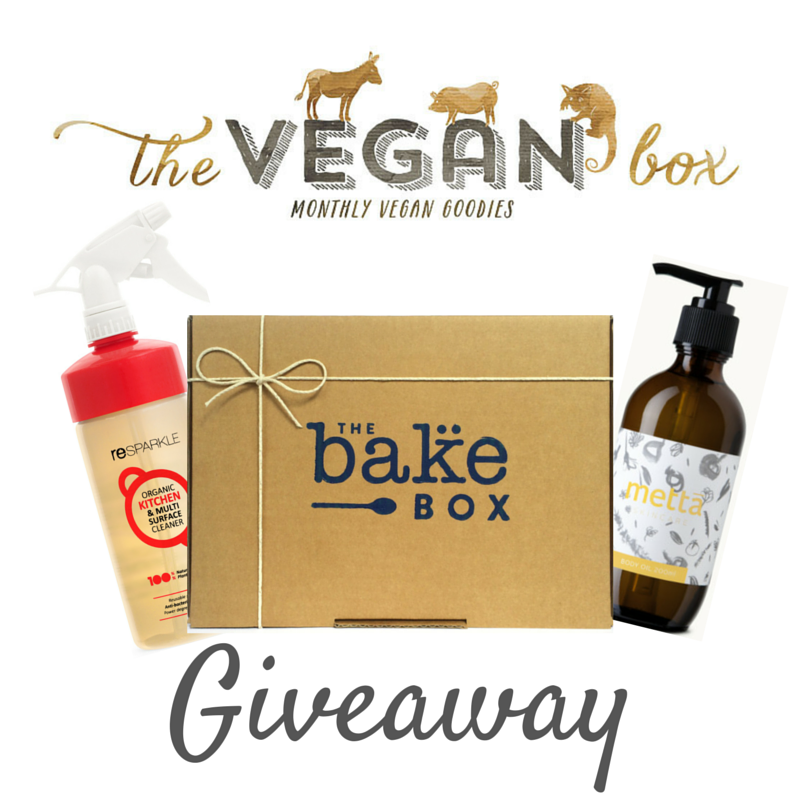 I would love to win because I love vegan products and supporting vegan companies 🙂 & I would LOVE to try bake box!!! This is great giveaway! I would be super happy to win this! I’m trying to jump on the hay cart! Climb the coconut palm. Saddle me up ’cause this black cat is ready to vegan! I really love to participate but i’m from spain 🙁 I hope that in the future, spanish could have a nice company like yours, we need more vegan options in my country. I think it is so important to use products that not only support a healthy environment, are good for you, but smell and feel delightful! As a environmentally conscious teen stumbling through the vegan kitchen in remote NT, I’m in dire need of some help! Would love to get baking! I’d love to win!!! I’m obsessed with body oil and absolutely love baking! I’d dance around with nourished skin, a full belly, cleaning my house! My three little women love cooking and I love cleaning and we all love to smell nice! Love a Vegan Box.. I love being vegan but it can be difficult to find the right products to use! Lately I have been craving some delicious yummy treats and the bake box would help cure them! But I am a very messy cook so reparkle would defiantly come in handy! Everyone loves some ‘ me time ‘ and the metta skin care oil sounds Devine!! It’s my dream box to convince my boyfriend that veganism is hot – massage oil, baked goods AND he doesn’t even have to clean up afterwards. I would love to win this as a surprise for my best friend/housemate. She has had a really rough start to the year, and it makes me sad seeing her struggle so much. She never treats herself and can’t afford to buy any of the really nice vegan products for herself so I thought it would be really nice if she won this! She’s the kindest and most genuine person I know with the biggest heart… A little surprise like this would make her day. It’s all ready hard to be vegan and try to stay vegan in Turkey! Yeap i love to have one of those too. Since having a baby I’ve become obsessed with vegan products that we can both use. I’d love to sample some with my babe sometime! I have a huge sweet tooth and im a new vegan. This would definitely help me on my journey to health, happiness and discovery! I would love to win to try all your Melbourne goodies in Poland! I’ve started my journey as a vegan… Commitment. Passion. Consciousness. Ethic. Courage. Faith. Adding a Vegan Box, nothing will ever get in my way! I am on a journey to fertility through wellness. I would love some new products to try on my journey. I prefer to shove my vegan ideals down people’s throats via delicious baked goods. People can’t complain with their mouths full! If I won I could get busy in my brand new kitchen and share the vegan love. A poor Melbourne university student passionate about animal rights but struggling to afford vegan products 🙁 desperate and in need of help!